Hopefully you’ve finished off the last of the roast beast and are ready to shop! Lobster tails are everywhere, with HEB/CM coming in cheapest. Get your bisque on, Cheepsters! ( I feel like that’s not a saying that will catch on. Doesn’t mean you shouldn’t see if you can work it into your everyday conversations). There are also good deals on boneless chicken, black eyed peas, and citrus. This week’s got Randalls continuing the Fab!5 sale, where you need to buy five of certain items to get $1 off each. There are many to mix and match, the ad shows them in surprising combinations–cornbread mix and bottled water? If you want five, they’re 59c/ea! There are also some odd choices. Do you need five French Baguettes? Even the photo they’re using to advertise couldn’t deal with five, but if you want them, they’re at Randalls. Possibly on sale, but the ad indicates ‘Everyday Price’, as well as ‘Buy 5 save $1’ so it’s a mystery. On to the sales! Remember to let Cheepie know if you find a great deal–you can find me on Facebook and Twitter in the sidebar. You stay you, Fiesta. Never change. I know. This is a confusing time for all of us. We can get through this. If you’ve followed for a while, you know that because Randalls is the most convenient to me, and I know it like I know where to find my favorite books at the library, I’m in there from time to time for things like bread, milk, and toilet paper. I never do a huge shop there, but I certainly do head in to hit the loss leaders and the clearance rack. That’s not the same at all! I stood there for a minute, wondering if I’d misremembered. Then I started to freak out, because I’d kicked off the ad post joking about chumps who don’t do math, and had I somehow calculated the price per pound wrong? This was $3, the same as the 2lb bricks on sale, not different! Frickity! Up to the front of the store to get the weekly ad, and sure enough, I’m not crazy, and there in the center of the fourth page is my deal. 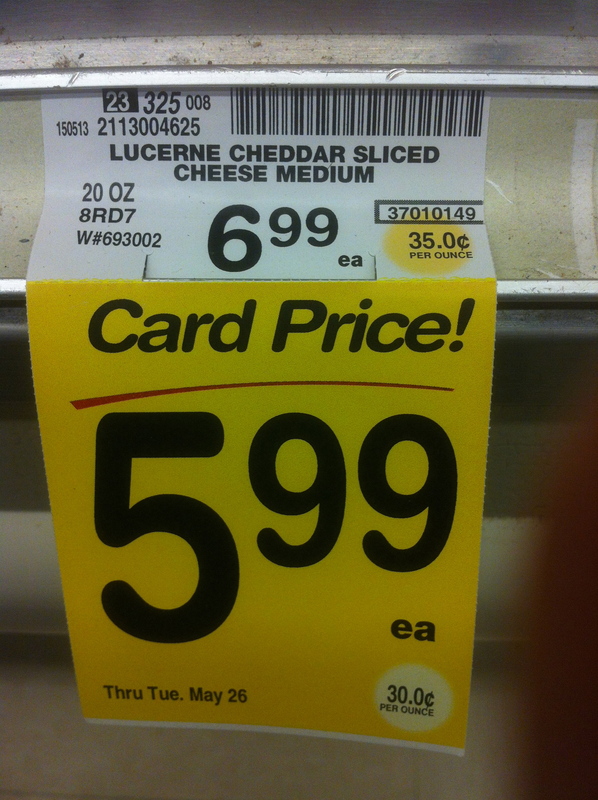 Which is a crazy good deal, and the way it’s hidden there I figured I was being awesome telling everyone about it. Two packages go in the cart and I head up with that and the bread and milk to sort this out so I can report back to the Cheepsters. I put them at the front of the belt, and when the cashier picked it up I showed him the ad. The ad does say ‘selected varieties’ and the photo shows one that this store had on hand. I’d chosen cheddar, since kids don’t like food that has two colors (no? just my kids? moving on then…). 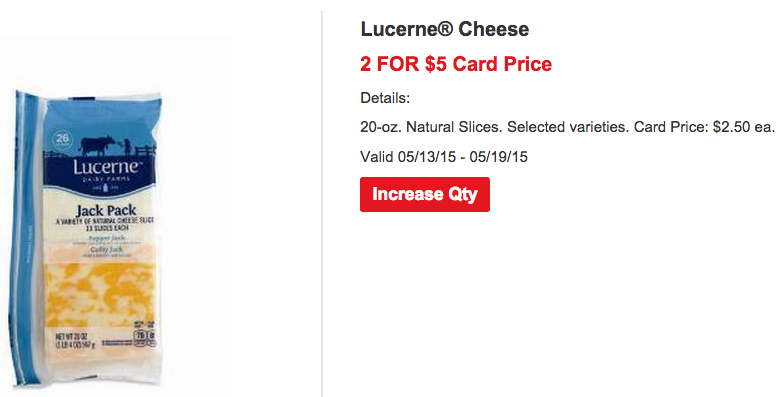 The cashier looked at the ad, at the cheese, and told me to hang on while he went to look. He got back, called a manager, and rang the rest of my order up while the manager repeated this process. The manager and cashier agreed that the ad certainly said that I should get the packages for $5, and that’s what they charged me. There might be a meeting happening tonight about putting signs up correcting the ad, but I’m glad with the way this was handled. It writes up slowly, but the whole thing was done before I’d even gotten the bags in my cart and everyone was nice. Randalls has its problems, but today they were a good store to be shopping. Berries! I’ve managed to stock up on berries often enough recently that there’s a good stockpile for smoothies in the freezer. Of course, my kids are now freezing due to the polar vortex. This week is another good chance, with berries on sale at Sprouts and HEB. These are especially easy to store, just pop in a freezer bag and get as much air out as you can. They’ll be ready to use in a smoothie or cobbler just like a sack of frozen berries from the store. Or your 7yo can thaw and smoosh them, and eat them with her hands. No? Just me, again? Okay. Also this week, HEB has those pork picnics I described in last week’s ad post, a bit cheaper, with a limit of two. If you’re thinking about that purchase, please check out my advice on this particular cut of meat here. But don’t get mixed up and think that post is this week’s ad post, just because they look similar. No? Just me, still? Okay. I’m glad you didn’t wander CM looking for kale that one time. Also! The 5lb sack of organic carrots is on sale again at Sprouts! Maybe this time I’ll make the carrot soup I wanted to make last time. It’s their turn to be first on the rotation, but they’re just too late getting the new flyer up. A girl can only refresh so long! So I’ll note anything worth a trip tomorrow. A note on Fiesta! If you don’t usually go to one, it’s worth checking out around the holidays if you’ve got any European or Mexican holiday items you wish you could buy. Not just the boxes of panettone, but British crackers, and all kinds of things show up there. It’s fun to check it all out. I love turkey, and if I”m cooking one it’s going to be bigger than 12lbs. I’m not going to sneeze at a free turkey, but I find just waiting for Randalls to put a turkey on sale for 69c/lb with a $50 purchase more straightforward than trying to find a small ham, and then find a turkey the right size to be free. They will credit the cost of 12lbs toward a larger one, so if you’re a ham AND turkey family, you might be able to use this deal. I’ll keep everyone posted about Turkey Deals as the next six weeks roll, because the deals vary from place to place.